Description: Broadmoor model backing to open space with a beautiful rear yard with fire pit! 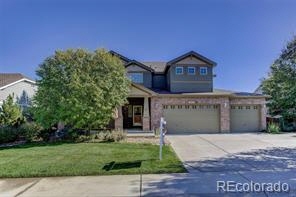 Vaulted entry with tons of natural light, new wood floors, new carpet and whole house surge protector. Spacious kitchen with stainless appliances, double ovens, new gas cooktop, loads of cabinets with tons of storage. The kitchen also offers a walk-in pantry, granite and large island. Opens to the great room with 2-sided gas fireplace and built-ins. Convenient main floor study and bonus space in the large upper-level loft! Four spacious bedrooms including a guest/teen suite. The generous master suite boasts a 5-piece bathroom, fireplace and large walk-in closet. Dual zone ac and furnaces. 2 yr old furnace, 3-year-old hot water heater. Full walkout bsmt. This subdivision boasts large lots and great neighbors!